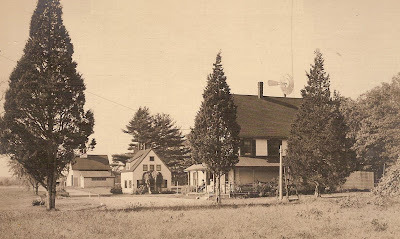 The home and outbuildings of Orville K. Gerrish near Loon Pond are pictured as they appeared about the time of Gerrish's retirement from horticultural work. In 1889, Gerrish had purchased 113 acres between Bedford Street, Precinct Street and Loon Pond on which he established a fruit tree nursey with over 100,000 specimens. Many of the trees were peach trees, and in 1895, the New York Tribune made note of Gerrish's eforts to revive peach cultivation in Massachusetts. In the early 1890s, Orville K. Gerrish established a large scale tree nursery on land adjoining Loon Pond in Lakeville on the site now occupied by the former Ted Williams Camp. Acquiring 113 acres between Bedford Street, Precinct Street and Loon Pond on March 12, 1889, from Horatio N. Sampson and the Washburn family, Gerrish laid out an extensive peach orchard which he operated for several years. Gerrish’s was a model operation, with carefully tended specimens, and modern innovations, including a windmill which pumped pond water to the nursery. Gerrish had been born in 1841 at Sumner, Maine, to farmer Nathaniel Gerrish, from whom he learned the rudiments of farming. The younger Gerrish later focused upon nursery work, both in Maine, and (for a short period of time) at Geneva, New York. As can be discerned from his comments to the New York Tribune in 1895, Gerrish was a well educated man with an inquisitive mind. In the late 1880s, he was engaged not only as a dealer in nursery stock at Portland, Maine, but as a lawyer as well. By 1895, the scope of Gerrish’s Lakeville nursery was enormous as indicated by the following description carried in the Middleboro Gazette on September 13 of that year. The article, itself, was taken from the New York Tribune which had taken note of Gerrish’s nursery as well as his effort help revive peach culture in Massachusetts. The time was when Massachusetts raised great quantities of peaches, and everybody had plenty, as now is the case of pears. Then came a blight, and the industry failed, and the trees almost entirely disappeared, and it came to be believed that this was finally and forever. But a better day appears to be at hand, and the prospect is that Massachusetts will become again a peach producing State. The man who has made this turn in the tide is named Orville K. Gerrish, and the house is in Lakeville, one of the southernmost towns in Plymouth County. His place is called the “Shadow Lake Orchards,” from a lonely little lake nearby. Mr. Gerrish is a native of Maine, and a nurseryman of twenty-eight years practical experience at Geneva, in western central New York. On a hundred acres of poor soil on which nothing but bayberry bushes, briars, wild ferns and weeds grew for many years he has now large orchards of thrifty, bearing peach trees and blocks of nursery trees – apple, peach and plum – to the number of 100,000 or more. Mr. Gerrish says he believes he has triumphed over natural climate obstacles and by the simplest and most inexpensive of methods. His system briefly stated, is to avoid forcing the growth of his trees, thereby making tender wood; to avoid long-bodied trees on which the early spring sun may shine, causing the sap to rise too soon, and to plant his trees close together. These seem to be the cardinal principles of a plan designed to combat the severe frost of winter. “I planted small, one-year-old, low headed trees, using no fertilizer of any kind about tree roots, and removed no limbs from the trees except bruised and dead ones. Immediately after planting, a mixture of potash and ground bone, in equal parts, was spread about the trees, which was all the dressing they received the first year. Since, they have been similarly dressed about twice each year with unleached ashes about the tree as the limbs expand, so as to keep a space cultivated and fertilized about as far as the limbs extend. I do no other cultivating after the first two years, than that which can be done with hoes, hoeing about the trees, clearing weeds, and grubbing the earth before fertilizing. Potash, an element which seems to be nearly exhausted in this soil, is essential to the peach tree, and must be supplied. I think unleached ashes is almost perfect fertilizer for the peach, and believe that people who burn wood for cooking, etc., could if they have ground, cultivate a few peach trees and, with the judicious use of ashes from stoves applied to the trees, easily supply themselves with peaches and have a surplus for market. This in brief, is the account, which we have condensed from the New York Tribune, of a success achieved only a few miles south of us, which deserves the attention of every tiller of the soil in southeastern Massachusetts. Our County Fair people should make a special point of this; for if our county could grow its own peaches, that would be a great improvement. By 1905, Gerrish had retired, and he enjoyed his new free time by traveling abroad. In 1922, Gerrish’s widow Alice sold the nursery which was owned and operated as a summer camp by Boston Council, Boy Scouts of America (1923 -1957) and as the Ted Williams Camp and Lakeville Baseball Camp. J. H. Hale, “Fruit Growing in Massachusetts”, Fortieth Annual Report of the Secretary of the Massachusetts State Board of Agriculture, Together with the Tenth Annual Report of the State Agricultural Experiment Station. Boston: Commonwealth of Massachusetts, 1892. Middleboro Gazette, “Massachusetts Peaches Again”, September 13, 1895, page 2.